I have pined away for a Revolutionary War Patriot in my lineage for a long time, but have come up disappointed at every turn. My husband, however, can boast of several. My best hope for a patriot is my direct-line ancestor Joseph Lair. Lair, the son of German immigrants, was born in Philadelphia in September of 1745, and by 1768 had purchased land in Rockingham County, Virginia. In 1788, he contributed horses to Captain Richard Ragan’s company, so he did at least something toward the effort. The DAR database confirms his contribution. Maud Ward Lafferty and Helen Lafferty Nisbet, in their book “Background of the Lair Family,” state that he no doubt served as well, in addition to his brothers, and that his service was likely documented in Virginia. I first took up the quest to find information on his service about 15 years ago, long before websites like Fold3.com were available. I had made note that he attained the rank of Corporal, but did not note the source of that tidbit. In the limited resources available at the time, I was unable to find much, so I made a few notes and stuck them in a folder. Now, I’m going through that folder and have picked up the job of looking for his service. The first stop was Fold3. 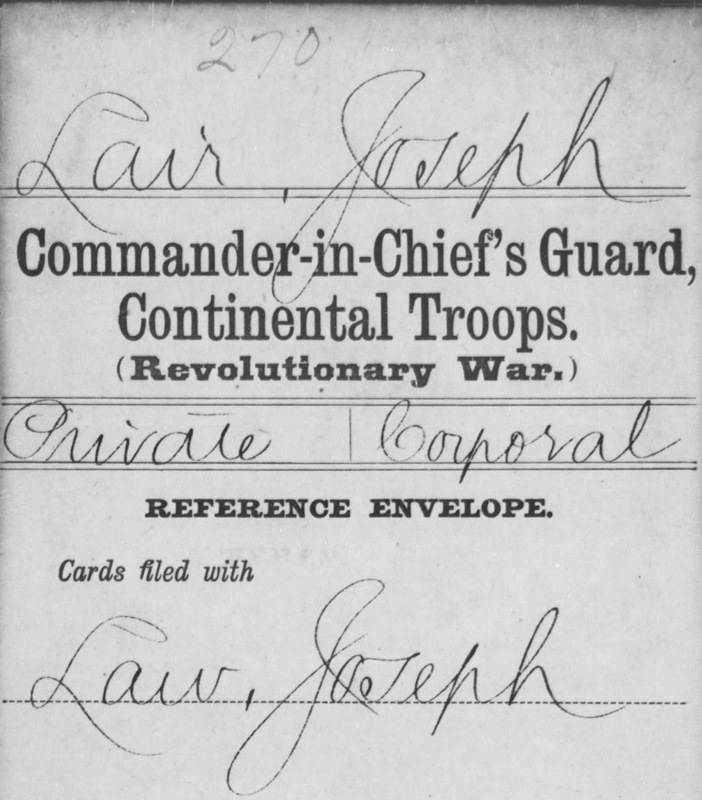 I was pleased to get an immediate “hit” – and discover a Joseph Lair who rose from the rank of Private to Corporal in the Commander-in-Chief’s Guard, Continental Troops, commanded by Caleb Gibbs. Caleb Gibbs was a “right hand man” of George Washington, and it was his duty to not only protect Washington, but to engage in battle as well. This was a big deal! Perhaps waiting all these years to discover a patriot was well worth it with a story like this for the family tree! However, the reference envelope pictured below notes that the cards are filed with “Law, Joseph.” And herein begins a whole new struggle. I looked at every muster roll available for this group, and beginning with July 1777 until July 1780, either a Joseph Lair or a Joseph Law shows up, but never both at the same time. A few of the listings are clearly “Lair,” more are clearly “Law,” and some could go either way. This man starts out with the rank of Private, and ends up as Corporal. Because both “Law” and “Lair” never show up separately, I have to conclude that this is the same man. Ugh. That's a good "Law." The loop at the end of the "w" is consistent with handwriting in other parts of the document. My Joseph Lair was born in Pennsylvania, but purchased land in Rockingham County, Virginia in 1768, and lived there until at least until 1792. Caleb Gibbs was associated with the 14th Massachusetts Regiment, but served elsewhere in his capacity with George Washington’s Guard, and since Washington lived in Virginia, it would not be inconceivable that Virginia men, such as Joseph Lair, were involved. It was noted that after the war, Gibbs returned to Massachusetts. So – who was this man? Was it Joseph Law, or Joseph Lair? And if it IS Joseph Lair, is it MY Joseph Lair? These are the problems that stand between me and a Revoultionary War ancestor. I wondered if I could document a Joseph Law as having served in the war, so it was back to Fold3 with a new search. 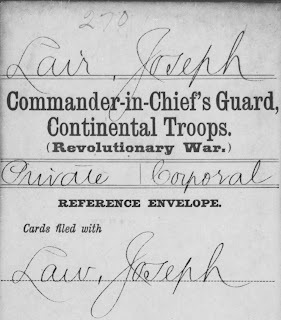 That search brought up a widow’s pension file associated with a Joseph Law who served with a Connecticut regiment under Colonel Chandler, for three years commencing from 1777. My hopes rose! Yes, there was a Joseph Law, but he was tied in up Chandler’s regiment during the time in question. Continuing on through the numerous documents in the file, I found another that stated he was transferred into Gen. George Washington’s Corps of Guards. Shoot (no pun intended). I am back to my previous condition of not having a patriot in my family tree. Oh, how frustrating! 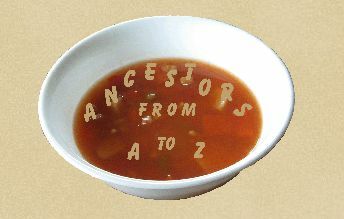 I may have two in my tree, my great grand aunt was a member of the DAR, but it will be a full-time job to prove it, if I ever can, and no one seems to want to pay me a salary to find my own ancestors!